Glasgow-based blender Whyte & Mackay is relaunching single malt brand Fettercairn, claiming the ‘time is right’ to reintroduce one of the ‘most beautiful distilleries in Scotland’. Malt whisky from the Highland distillery has mostly been reserved for use in blends, including Whyte & Mackay’s eponymous flagship brand. Aside from a few official and independent bottlings, Fettercairn has rarely been seen as a single malt until now. However, Whyte & Mackay, which also owns the Dalmore, Jura and Tamnavulin distilleries, said the ‘time is right’ to relaunch the brand with Fettercairn’s first new releases in almost a decade. The distillery is located in the village of Fettercairn, close to the Cairngorm mountains, and was built in 1824 by Sir Alexander Ramsay. Four new expressions are being launched in August, each of which is described as embodying the distillery’s floral and exotic fruit-driven character. 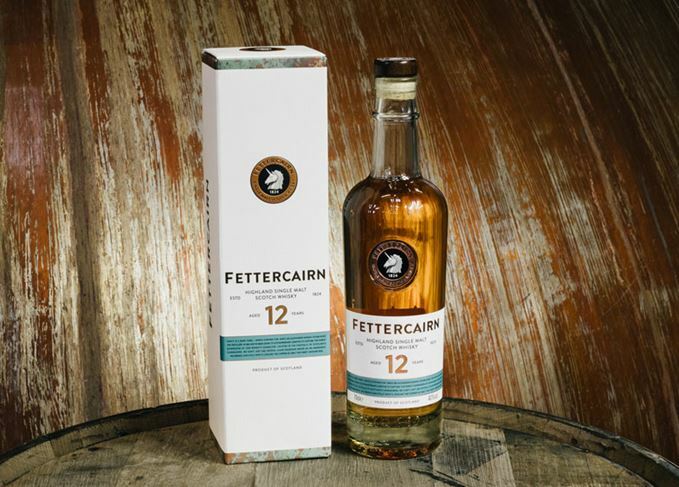 Fettercairn 12 Year Old was matured in American oak ex-Bourbon casks, and bottled at 40% abv. It is described as having bready, fruity notes of hot cross buns and cinnamon, and will be available for £48 a bottle. Fettercairn 28 Year Old was also matured in ex-Bourbon casks. Described as having notes of ‘dried pineapple, apricot, toffee and lime zest’, the expression is bottled at 42% abv and will be available for £500. Fettercairn is also launching a 40-year-old malt, a 1977 vintage matured in ex-Bourbon casks and finished in Apostoles palo cortado Sherry casks. Bottled at 48.9% abv, the whisky is said to have notes of honey, ginger and treacle, and has a price tag of £3,000. Finally, a 50-year-old Fettercairn will be released. Distilled on 11 June 1966, the expression is said to be rich and dark with notes of treacle, cloves and black cherry. It was finished in a tawny Port pipe for five years and bottled at 47.9% abv, and will be available for £10,000 a bottle. Daryl Haldane, head of whisky experience at Whyte & Mackay, said the group decided to relaunch Fettercairn after noticing a gap in its malts portfolio. ‘We’ve done a lot of work on Jura over the last year and Dalmore continues to perform really well at the top end, but between Jura and Dalmore there’s a spot there we can look at. The distillery’s relaunch follows that of sister site Tamnavulin in 2016, and a new brand and liquid identity for Jura in March this year. It also precedes the launch of two new brands from Whyte & Mackay in the coming months. The Fettercairn range is set to launch in the UK initially, before being rolled out to Whyte & Mackay’s main whisky markets, including Taiwan, France, Germany and the US. The last official bottlings released from the distillery were a pair of no age statement whiskies, Fior and Fasque, in 2010. Find out more about Fettercairn distillery in Scotchwhisky.com’s Whiskypedia section. The Moray distillery has launched Tamnavulin Double Cask in celebration of its 50th anniversary. As the new year dawns, Dave Broom ponders the value of moving slowly – for people and whisky.